For the first time, the Police Intellectual Property Crime Unit (PIPCU) went with positive messaging in a campaign warning people about the dangers of dodgy electrical products that could cause electric shocks or house fires. In a change from its traditional focus on negative messaging, the City of London Police unit decided to accentuate positive messages. Launched last November, the campaign was prompted by research from the Electrical Safety First charity that revealed one in three Britons have purchased a counterfeit electrical item, placing them at higher potential risk of a fire in their home. Campaign partners included BaByliss, Electrical Safety First, the Intellectual Property Office, the City of London Corporation’s Trading Standards, safety company UL and London Fire Brigade. 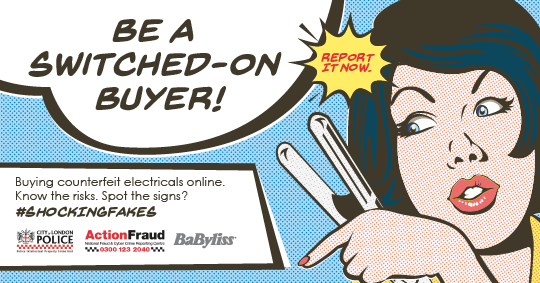 The week-long campaign focused on the problem of fake electrical products and used messaging encouraging people to buy electrical goods from reputable sources, rather than telling people not to buy counterfeit items. A central message was that PIPCU is the national policing lead for tackling the issue of fake products. Other key messages included reminding people that when they pay for genuine products they are investing in their own safety, with such goods having passed rigorous safety checks. Target audiences over and above the general public included the over 55s - a demographic most at risk from buying fake electricals - and 16- to 25-year-olds due to this age group seeking to become more responsible shoppers. 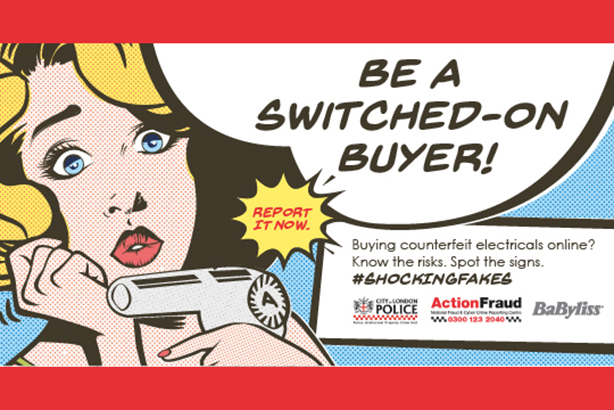 A Pop Art-inspired cartoon was created to promote the campaign on social media with the hashtag #shockingfakes and the slogan 'Be a switched-on buyer!' was used on campaign visuals. 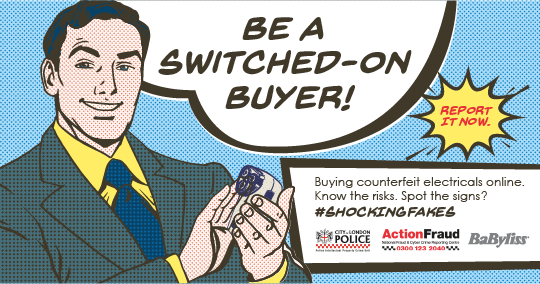 Our new #shockingfakes campaign warns against the dangers of buying counterfeit electricals online. The reach of the campaign was extended through the actions of the campaign partners in amplifying the social-media activity. The campaign resulted in widespread coverage by national, regional and specialist media and total monthly visits/circulation of 1,110,208,610. This was significantly more than the 69,853,824 for PIPCU’s safety campaign in 2017, which warned of the dangers of buying counterfeit goods online. Research conducted for PIPCU by Ipsos MORI, of 1,000 UK adults before the latest campaign’s launch last November and 2,000 UK adults two weeks later, revealed that just under a third of respondents said they had heard of the campaign, and that buyers were more likely to say they would purchase from official channels. It also showed an increase in awareness of the risks of purchasing faulty electrical items. Nonetheless, PIPCU's evaluation of the campaign noted that although it reached its target audience, "it wasn't able to create a significant impact on attitudes around counterfeit electrical goods and where consumers purchase". It concluded: "The lack of a case study or real-life example of the threat meant that the campaign had little impact on the behaviours of the public. As such, similar future campaigns should focus on the need for a case study in order to develop and strengthen the behavioural change outcomes." Emily Boneham, PIPCU press officer, told PRWeek: "We were able to reach our target audiences with positive, empowering messages about where to buy genuine electrical products, as well as increase awareness of police support and legislation around counterfeit electricals." She added: "The market research from IPSOS Mori was particularly valuable in showing who we reached and how we reached them. It is this research that has led us to consider a second phase of the campaign. This will be spearheaded by a case study’s experiences in order to strengthen the behavioural change outcomes."